Boeing employees work on a Dreamliner wing during final assembly of the jet. Hairline cracks in some wings, disclosed Friday, are the latest problem for the plane. Boeing's Dreamliner has been a big success for the manufacturer, racking more than $200 billion in sales. But the fuel-efficient, lightweight jet continues to be hit by problems. On Friday Boeing announced that a manufacturing problem had cause hairline cracks in the wings of some Dreamliners. None of the planes affected have been shipped to customers yet. The hairline cracks come a little more than a year after safety regulators grounded the Dreamliner for three months due to a fire risk associated with the plane's lithium battery. "It's not this particular (cracked wing) problem that's important. It's the pattern that's important," said Richard Aboulafia, aerospace analyst with the Teal Group. "They produced a very promising jet, but clearly it's a work in progress. It's not a happy situation." News about the cracks on Friday were quickly overshadowed by the tragedy of a Malaysia Airlines' Boeing jet. The aircraft disappeared and is presumed to have crashed early Saturday in Asia. There were 239 passengers and crew on board the Malaysia flight. Until the plane is found, it's unclear whether the crash was caused by terrorism, pilot error or some kind of aircraft failure. But the Boeing 777 used on that flight is one of the safest aircrafts in the world. During 19 years in service it has had only one fatal incident, the Asiana Airlines crash last year in San Francisco, which has been blamed on pilot error. The Boeing 787 Dreamliner has a much shorter history, having entered service in October, 2011, more than three years behind schedule. The launch was delayed due to problems with the light-weight composite materials that Dreamliner uses to improve fuel economy, as well as Boeing's greater use of outside parts suppliers. The latest problem occurred with one of those suppliers, Mitsubishi Heavy Industries, which is building the wings and shipping them to Boeing. Boeing said Friday a change in the manufacturing process might have caused the cracks. One expert says he doesn't believe the cracks represent a major problem for the aircraft maker. "This appears to be more of a minor manufacturing error than anything else," said Carter Leake, an aerospace and defense banker with BB&T Capital Markets. Despite the manufacturing problems and delays, demand for the plane has been exceptionally strong. Airlines are eager to cut fuel consumption, their biggest operating expense. Boeing has taken orders for 1,031 of the jets since its first order in 2004, making it by far its best-selling wide body jet during that time. There were orders for 183 of the jets last year alone. Strong Dreamliner sales have helped lift Boeing (BA) shares by 66% since the start of 2013, making it the best performing stock on the Dow Jones industrial index during that time. Shares slipped more then 2% on Monday. 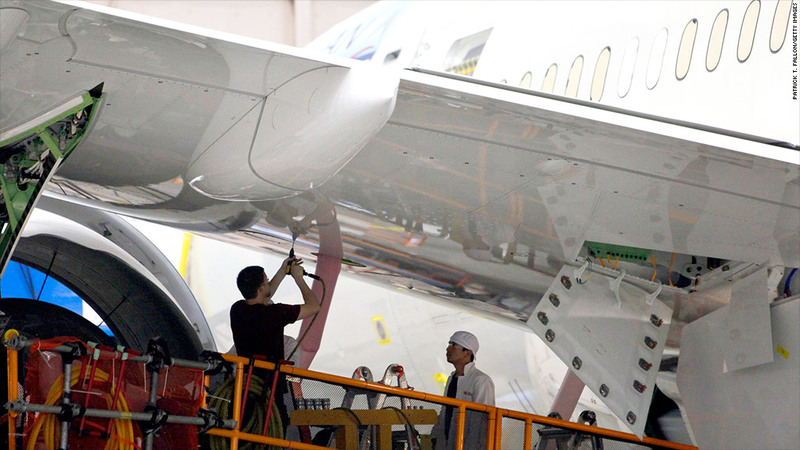 But the sales of both the Dreamliner and the jet's next-generation 777-X, might have even been stronger had it not been for these manufacturing problems, says Aboulafia. He said new revelations about cracks in the wing only add to a troubling pattern that gives pause to potential airline customers. The combination of delays bringing the Dreamliner to market, the battery problems and uncertainty about when the 777-X will be available has prompted some Boeing customers to place orders for widebody jets with rival Airbus. "Those are all sales that should have stayed with Boeing," he said.